This year the ADG moved the Excellence in Production Design Awards Ceremony to a new venue, the Ray Dolby Ballroom on the top floor of The Loews Hollywood Hotel, home of the famous Dolby Theatre in Hollywood, California. For the new venue the ADG needed a new stage set and they wanted to use this opportunity to create a new look for the ceremony. 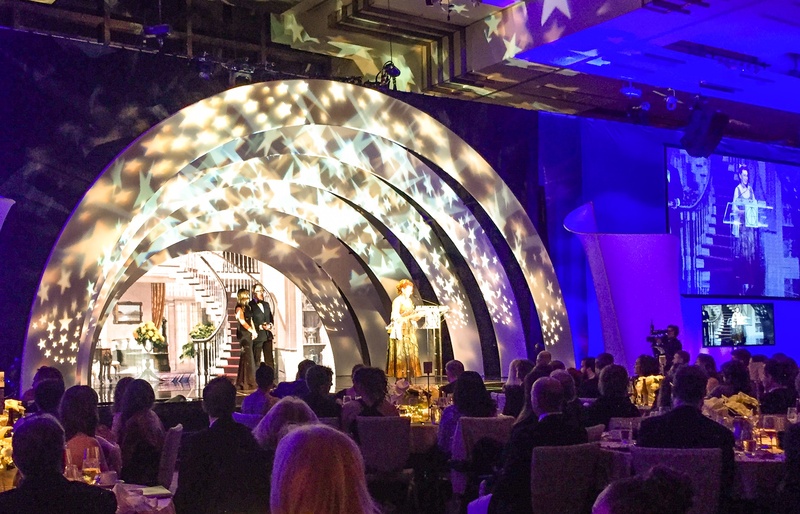 Inspired by the Hollywood Bowl, the classic outdoor venue in Hollywood Hills, and in collaboration with the ADG, Transformit created Hollywood Arches, the new stage set for the ADG’s awards ceremony. 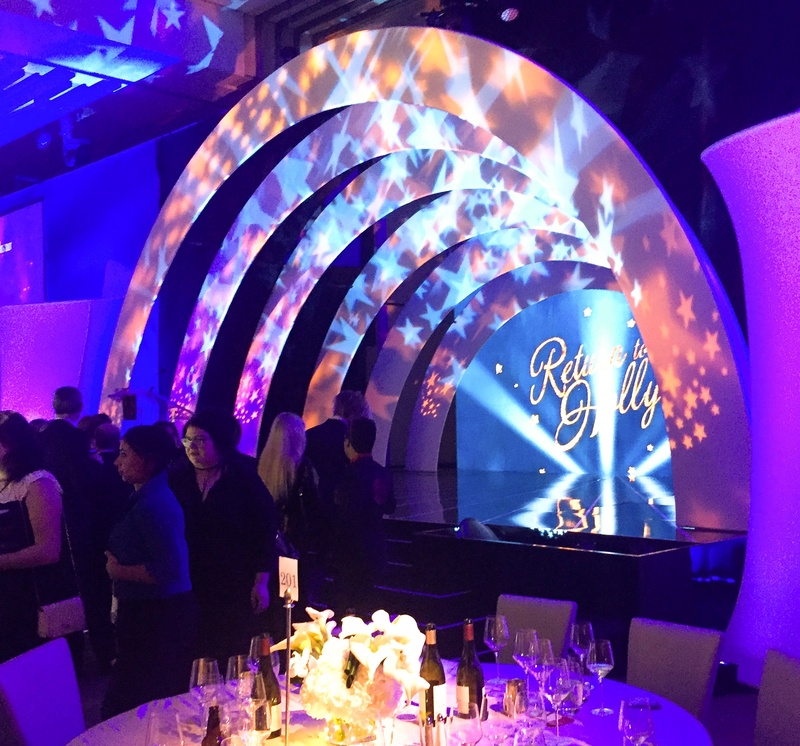 Hollywood Arches is a series of six concentric fabric arches secured together to create a freestanding 35’ wide by 17’ 6” tall by 15’ deep stage piece. 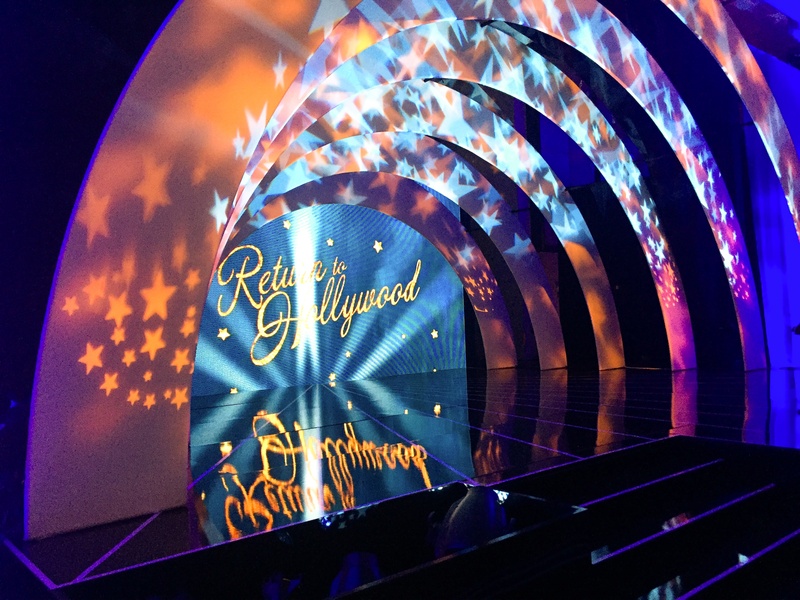 For the ADG’s awards ceremony, presenters entered between the individual Hollywood Arches from the wings on either side of the stage. 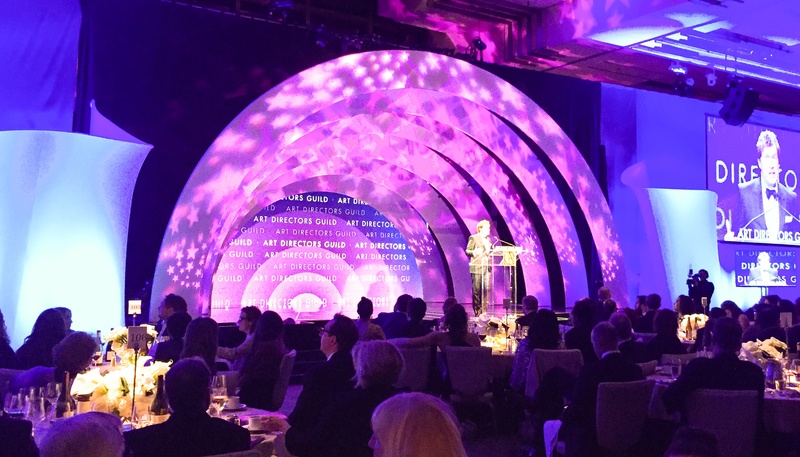 A video wall, placed upstage behind the smallest arch, displayed images of classic award-winning stage sets. The white fabric arches also served as a 3-D projection surface for a dynamic video and lighting projection, so a layer of light-block was used in each arch to ensure the framework was invisible and to eliminate light bleed. In addition to the Hollywood Arches, two 14' x 22' Crescendos, ready-made stock pieces from Transformit’s Fascinating Rhythms collection, framed large side monitors showing trailers for the nominated movies and TV shows as well as the live feed of the televised event. Hollywood inspiration and suitability for video and lighting projection were certainly guiding parameters for the conception and design of the Hollywood Arches, but so too were production requirements. The Ray Dolby Ballroom was not available for set-up until the day of the show, so assembly of the stage set needed to be quick and easy. The stage set also needed to break down for compact storage and to minimize transportation costs. And, the built set needed to meet seismic related specifications of California’s building code. As is the case with most Transformit pieces, no tools are required for assembly and disassembly of the arches. The joinery we custom mill in-house is designed so that the components of each frame are assembled and disassembled by hand and the fabric skins affix to the frame with zippers. The entire set—the Hollywood Arches, the Crescendos, and hardware—fits into three 8’x2’x2’ road cases. And to facilitate rigging attachments that may be necessary to comply with California building code, hang points are incorporated into each arch. The ADG 21st Annual Excellence in Production Design Awards Ceremony was held Saturday, February 11, 2017. Winners included La La Land, Hidden Figures, and Passengers. As for the Hollywood Arches, the ADG was delighted with the set and plans on using it for several years to come.